Migrants who were found at sea on a boat sit near Kanyin Chaung jetty after landing outside Maungdaw township, northern Rakhine state, Myanma,r June 3, 2015. Myanmar immigration authorities say Bangladesh has agreed to take back 200 boat people rescued off the Myanmar coast last month. A total of 208 refugees, all men, and 11 crew members were found aboard the ship, which had been at sea for months. All but eight of the men declared they were from Bangladesh and are being held at a detention camp near Taung Pyo, Myanmar, just a few kilometers from the border with Bangladesh. The other eight have been identified as Muslim Rohingya from Rakhine state in western Myanmar. The government does not recognize the Rohingya, referring to them as Bengalis. Authorities said Thursday that the repatriation process for the Bangladesh citizens would begin Sunday. Meanwhile, Myanmar said it was set to begin processing more than 700 boat people it rescued off its coast earlier this week. Officials near the western border town of Maungdaw told VOA reporters who traveled there that the refugees, including more than 70 women and 40 children, were being brought to an immigration center near the town of Taung Pyo. The authorities said it would take three days before officials could determine the status of the people and decide what to do with them. An identity number tag is seen on the neck of a migrant, who was found at sea on a boat, near Kanyin Chaung jetty after landing outside Maungdaw township, northern Rakhine state, Myanmar, June 3, 2015. VOA has been given exclusive access to the detainees at the immigration center. They said they had endured three months of horrific conditions before being brought back to land. A majority of the men said they were kidnapped from Cox’s Bazar and other ports in Bangladesh, only to be sold to human traffickers. Ismail, 54, said he went to Cox’s Bazar in search of local employment. “When I get there, a broker trapped me into this mess. I did not intend to go to Malaysia,” he said. The boat that was found at sea carrying migrants is seen near Kanyin Chaung jetty after landing outside Maungdaw township, northern Rakhine state, Myanmar, June 3, 2015. In an initial show of hands, all but one of the men said they had been forcibly taken to the boats. But when answering a second question, about one-third of the men said they would try in the future to find good jobs overseas. While VOA was interviewing the men, three plain-clothed officials who did not identify themselves monitored the proceedings and taped the encounter on cellphones. The men have been in the detention center for almost two weeks since being rescued on May 21 after three months at sea. One man named Muhammad said the conditions were a nightmare. “My experience on that fishing trawler is the worst, which I’ve never suffered like this my entire life. We were fed rice twice a day on board and we survived,” he recalled. He added they were given only a little bit of fresh water and were beaten if they asked for more. Myanmar authorities told VOA that officials from the Bangladesh embassy had visited the refugees May 25 and are working to verify their claims of citizenship. If they are found to be telling the truth, the authorities said, they will be repatriated. One man named Mahmoud openly wept as he called on Bangladesh to bring them home. “Because of that crook [the broker], we suffered for three months at sea without help. 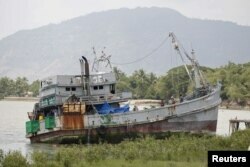 If the Myanmar navy had not rescued us, we would have starved and been doomed at sea,“ he said. The alleged Thai owner of the ship and at least nine of the crew have been detained by Myanmar pending an investigation. They have not been made available to the media to tell their side of the story. Eight self-described Rohingya from Myanmar were among those rescued from the boat, but VOA was not able to talk with them because they are being held for investigation and authorities will not permit media visits with them. Northern Rakhine state is “one of the most oppressive atmospheres I've ever traveled in,” said the U.S. State Department's Anne Richard. “It's very strange to be surrounded by people looking at you who are too afraid to talk to you. And especially when they're children. That's just not normal,” Richard told reporters in Indonesia on Wednesday. Since the discovery of mass graves in the jungle along the Thai-Malay border a month ago, authorities in Thailand, which is governed by a military junta, have arrested more than 50 people. Activists contend the smuggling route could not have endured for so many years without the collusion of authorities, especially in Thailand and Malaysia. Both countries have now vowed a full investigation. A senior Thai military officer surrendered to authorities Wednesday as the most high profile suspect linked to human trafficking. "I ask for justice. I'm ready to fully cooperate with officials in every way," Lieutenant General Manus Kongpan said before turning himself in to police. U.N. officials on Wednesday estimated there were about 2,000 migrants still at sea. VOA correspondent Steve Herman contributed to this story from Bangkok.